This entry was posted in History - Religion - Education and tagged Apostle Paul, Christ, Christianity, Hellenism, History, Jesus, Jewish Mysticism, Judaism, New Testament, Religion by Professor Taboo. Bookmark the permalink. Really cool! I think I watched that movie! It is refreshing and liberating to find out the rich history behind all the dogma, and of course, the revelation Christianity is just like every other religion! Do you know Ancient Greek? I love trying to learn it albeit it being so hard grammatically! Ancient Greek? That’s a funny question LoR because since Greek and forms of ancient Hebrew (Tiberian, Mishnaic) and Aramaic (Jesus’ two languages, Aramaic being a mixture of 3-4 Middle Eastern cultures) are verbally extinct now, so I am constantly learning, correcting, learning again, recorrecting, etc. The dialectic context is so complex with slight variations and nuances… the right answer to your question is no. I have only a basic novice-to-intermediate level grasp/recognition with a LOT of scholarly expert help from those who have spent their entire lives studying linguistics. Exactly. On the subject of translation and transliteration, most average Christians today (perhaps even zealous ones) do not know just how VERY common the name of Yeshua (Joshua/Jesus) was in 1st century Galilee, Judea, and Jerusalem. Again, this is a result of the large “gulf” (naivety) between Hellenic culture and Hebrew-Aramaic culture back then, and even today — and though the discovery of the Talpiot tomb in south Jerusalem (1980) is ongoing and still being studied and critiqued, the contents found undisturbed inside the 1st century CE tomb make it particularly unique. Maybe even cataclysmic for Christendom. For us lay scholars on this subject here’s a pretty good read. https://www.google.com/amp/s/m.jpost.com/Christian-News/Geologists-claim-statistical-findings-science-prove-Jesus-buried-in-Jlem-with-wife-supposed-son-396262/amp. Excellent post again boss. I thought it was pretty telling. It might just be the real deal. Then we’ll hear apologetic stories about Jesus adopting and taking a celibate marriage. Something that puzzled me in that article … they said it bore the inscription, “Jesus, Son of Joseph.” Huh? His real name was Yeshua! Perhaps they used the more familiar names for the average reader, but to be “genuine,” I would think they would have used the correct name(s) and then explained themselves. And then the comment, “After all, Joseph, Mary and Jesus were all common names at the time” … ?? For me, this takes away from any credibility associated with the discovery. [later addendum] — Forgot to address your last question/concern Nan. 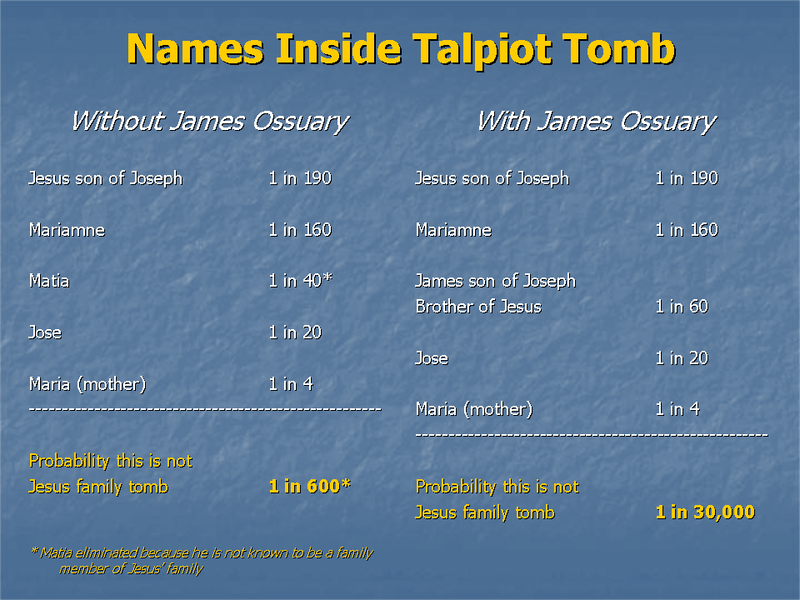 Regarding the common popular names of Joseph, Mary, Jesus… what makes the Talpiot tomb and six ossuaries so extraordinary and cataclysmic for Christendom is the statistical probability of ALL those names — especially James the Brother — being present inside the same family tomb dated to 1st century CE Jerusalem in a location consistent for Jewish burials. If anything, this/these finds cannot be ignored or dismissed regarding the “resurrection” (myth) of Christ — everything the “faith” hinges on. Yes, agree there. In my Oct. 2012 blog-post about it I did use the Aramaic names as well as their English translations. When catching documentaries on the tomb, Dr. Shimon Gibson, Simcha Jacobovici, and Dr. James Tabor all speak/use the Aramaic names and it gets translated into English. I always find it ironic how so-called professing Christians ( and we can name several right here in Blogsville) are wont to claim they are seeking truth and /or the bible and Jesus’ teachings reveal this truth yet, the very source they claim where this truth(sic) resides has likely been subject to more abuse in one literary form or another than almost every other literary work, fiction or otherwise. That most readers of the bible were/are largely unaware of its history, and especially the chronology of the ”books”, and that those who do know have never been seriously inclined to educate or enlighten speaks volumes about the motivation of those who often held sway over the life or death of the followers of this vile religion. Excellent posts such as this will add to the catalyst that inevitably sounds the death knell for Christianity. Ark, you (and Princess Leia) could not be more spot on. Indoctrination is a cerebral helmet that thickens and thickens, and squeezes and squeezes, cutting off ‘power’ from the neck-n-below… until at some inevitable point none of one’s 12-15 sensory-receptors and cognitive interpreters function in any sort of progressive, evolving, adapting, and questioning manner. Once this avenue of history has been thoroughly examined I suspect that scholars will have to face the inevitable – it is all made up; nothing more that Historical Fiction from beginning to end. Even one as unschooled in this area – me – could quite easily draw up a list of factual events contained in the bible, and I strongly suspect it would be a very short list! Interesting details, much of which I never knew. Found your various tables very informative, especially the Canonical Debate table. Had a rough idea this was more or less what happened but I’ve never before seen it outlined so clearly. Thanks for an interesting series. Terrific post. I knew from listening to Bart Ehrman that Paul’s epistles were written before the gospels, but I didn’t know the basic time sequence. Your table is a great reference. Like Ark above, I’m amazed at the devout Christian who quite frankly knows hardly anything, historically or culturally, about their professed religion. If we gave a simple True/False NT test to the true believers who attend the Lutheran Church here in Decatur, I think we’d be stunned at the fail rate. There is no simple answer, but one plausible reason is the Christian flock do not read the book they tout as the True Word. And to make it easier for them NOT to read the Bible, or God forbid, any book that isn’t “faith-based” is that their minister, as so directed by the good lord, will tell them what they “need” to know. Knowledge has always been the great Satan for good Christian folk who declare the Bible to be the inerrant word of God. After all what was forbidden our mythic parents? Fruit from the tree of knowledge of good and evil. Hmmm, maybe it wasn’t knowledge of evil that bothered God so much, as it was the knowledge of Good! This has been my contention for many years … and is the primary reason I wrote my book. The “flock,” in most cases, know little beyond John 3:16. Knowledge has always been the great Satan for good Christian folk who declare the Bible to be the inerrant word of God. Hear hear Sir! “Censorship” is the real cancer to brilliance, teachable moments, and refinements for humanity. Censorship is really no one’s jurisdiction, except only in rare, extreme circumstances; i.e. Oppenheimer and his team on the Manhattan Project and the massive moral/virtuous dilemma they faced with their “creation” to name just one example. Superb, my friend. Your writing and expertise on this is outstanding. Now, I’m gonna go back and read this again. Thanks for doing this. You should write a book on this. You’ve got a time machine? Awesome! I’ve got a particle accelerator I eff around with in my studio apt. Yesterday. I opened a worm hole to the other side of the galaxy. Took me all night to close the bugger. I know. 2 feet tall with a lightening bolt stuck to my hand. Ugh! I’m thrilled you added all the stories; the canonical and apocryphal books. It’s only then that you see the complete mess. In the Gospel of Peter Jesus is sentenced by Herod Antipas, not Pontius Pilate, and in the Gospel of Truth the hero is nailed to a living tree, not a Roman cross, which then spews forth fruit like an exploding piñata. None can agree on the character Jesus, and they have him doing different things at different times. The infancy gospels, with a murderous Jesus, are my favourites, though. It WAS a complete mess wasn’t it? Today, most just don’t realize (naive ignorance?) just how massively impactful Hellenistic Rome wrote Western sociopolitical and religious history at the expense of the history and culture of their conquered and subjugated, i.e. Judaism, particularly Sectarian Persian-Arabian Judaism of which Jesus/Yeshua was clearly descended. Everything you’ve mentioned should’ve NEVER been censored out by the Hellenic Patristic Fatherhood (for the sake of faith later) from the Early Church, later Roman Catholic Church. The fact that they did do it speaks a lot about the veracity(?) of the final product some 100-300 years later, i.e. the Patristic canonical NT. Watch the video Ark just posted. I think you’ll enjoy it.